"The Pillowman" brings something rarely seen on Hawaii stages -- suspense. 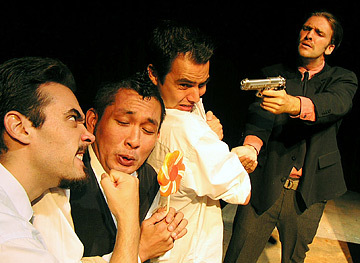 The thriller stars, from left, Reb Beau Allen, Troy M. Apostol, Gilbert Molina and Christopher Cappelletti. HAWAII audiences love musicals and comedies, so any drama presents something of a challenge in drawing people into theaters, even without the sinister sensibility at the heart of "The Pillowman." But given the current fascination with horror films, the time might be right for this macabre and unforgettable detective story by celebrated playwright Martin McDonagh. The story centers on Katurian, a writer of children's short stories. Far from having happy endings, his works are grim and twisted, and central to this play is his story of "The Pillowman," a character who snuffs out children as an act of mercy, to save them from worse suffering they are fated to endure in later life. » Place: The ARTS at Marks Garage, 1159 Nuuanu Ave.
Katurian is arrested by two police officers after several serial murders that follow the plot of his stories. Facing execution, Katurian must unweave the tangled web of his own life in order to save himself and, perhaps more important, to save his stories from being destroyed. Director Alvin Chan said he was drawn to the story by McDonagh's crisp, cinematic writing, which places its soul in the hands of the actor. "It was something so different from what I'd seen or read anywhere. The writing is so vivid, so dark and at the same time so comical," he said. "It touched me immediately the first time I read it. "We've come to rely so heavily on lavish sets and big musical numbers that I think a lot of us have forgotten the true bread and butter of theater -- the story -- as opposed to grand, flashy spectacles." Without any song and dance or lavish set, Chan says, quite simply, "This play will sneak up on you, give you a tickle and then smash you over the head with a hammer." Gilbert Molina, who plays Katurian, approached Chan about directing "The Pillowman" after the work caused a buzz after a reading at the University of Hawaii. The work also stars Chris Cappelletti and Reb Beau Allen as police officers Tupolski and Ariel, respectively. In New York, where I saw Billy Crudup -- nominated for a Tony Award last year for his portrayal of Katurian -- and Jeff Goldbloom (Tupolski) in the production in the medium-size Booth Theatre, some audience members screamed and some leaped out of their seats, they were so wrapped up in the play's suspense. Others simply walked out when it got too creepy, so it will be interesting to see how the production works in the spare, intimate setting of the ARTS at Marks Garage. "It puts the audience in the action," Chan said. "The audience is right there in the interrogation room. "A lot of things are hard to accomplish without a big budget. We've had to be resourceful," Chan said, but he adds that those familiar with the work can expect to see Katurian's tales of monstrous Pied Piper-like characters and "The Jesus Christ Girl" come to life. 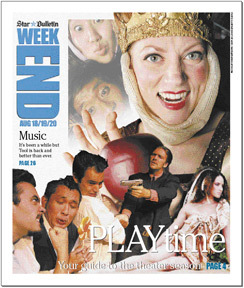 "A person's childhood is a huge part of this play," Chan said. "Regardless of how we've tried to change or not change ourselves since then, we are all still affected by it. "Even as an adult, we do have an inner child that blinds us to what's right and wrong. I hope this play will challenge audience members to take a deeper look at who they are today and how they got to be this way."